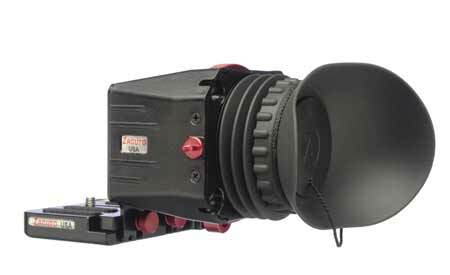 The Z-Finder Pro 2.5x is another one of Zacuto’s Optical Viewfinders that allows DSLR cameras to have the correct form factor for video. It offers 2.5x focusable magnification (3x is available),a 40mm diameter Zacuto optical designed lens, an anti-fog coating protective cover, an eyecup preventing extraneous light leakage, a diopter and a field of view perfectly matched to 3” LCD screens. The diopter allows you to dial in the focus to match your eye. If you need extra focal point you can use the Z-Finder Extender Frames. The Z-Finder Pro 2.5x has a diopter range of -4.75 and up (unlimited with extender frames). These are semi-permanently stackable frames that attach to the skirt of the Z-Finder Pro and extend the Z-Finder glass further way from the LCD screen for people who are farsighted. 1. The anti-fog coating protective covers are expendable. They act as a protective cover to your lens so your lens does not get damaged and they also help prevent the fogging of the lens. If you need extra anti-fog protective covers, in case they are scratched, lost, damaged, etc., they can be purchased separately here. 2. If you are using a battery grip on your small bodies DSLR camera, you will need this battery grip frame. If you have a taller body camera like the Canon 1D Mark IV or Nikon D3s, you will need the tall body frame. – The Z-finder is a magnifier and as such will magnify the sun and could damage the LCD screen if the sun is allowed to shine directly through the Z-finder lens. This is not a defect but a physical property. Caution should be taken to avoid sun magnification. -The tapped holes on the bottom of the Gorilla plate are offset from the center of the lens. This is only a concern if you are using the Gorilla plate with other rigs that need the matte box in line with the lens/mounting screw hole. You can order our Gorilla Plate Adapter below. Our Gorilla Plate Adapter centers the tripod holes on the bottom of the gorilla plate. Please note that this adapter does come with a longer 1/4 20″ screw that will replace the smaller 1/4 20″ screw that comes with the Gorilla Plate. You will need to take your screw out and use the longer one provided with the adapter to attach your camera to the plate. -The gorilla plate covers the battery compartment door on the Canon T2i Camera. If that is a problem, we suggest using the adhesive frame.